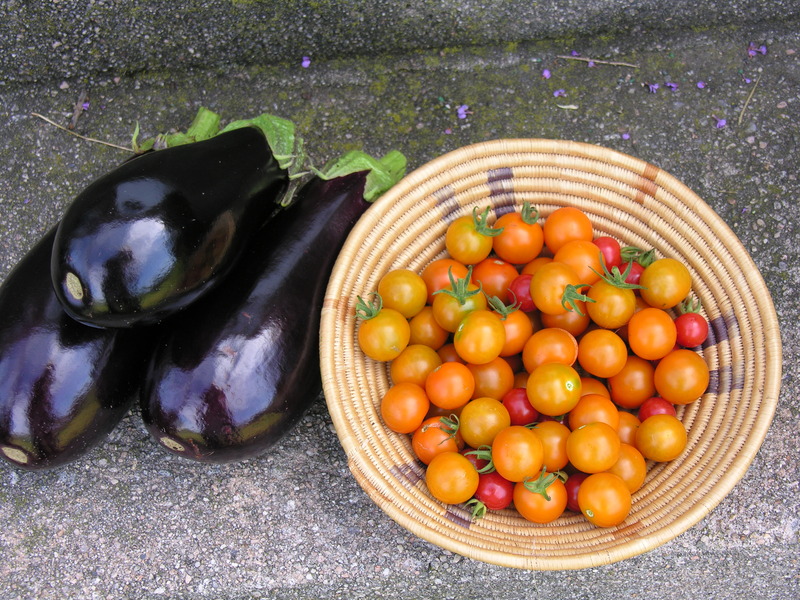 This is today’s tomato and eggplant harvest. I am picking and picking every day and each morning, there are more! 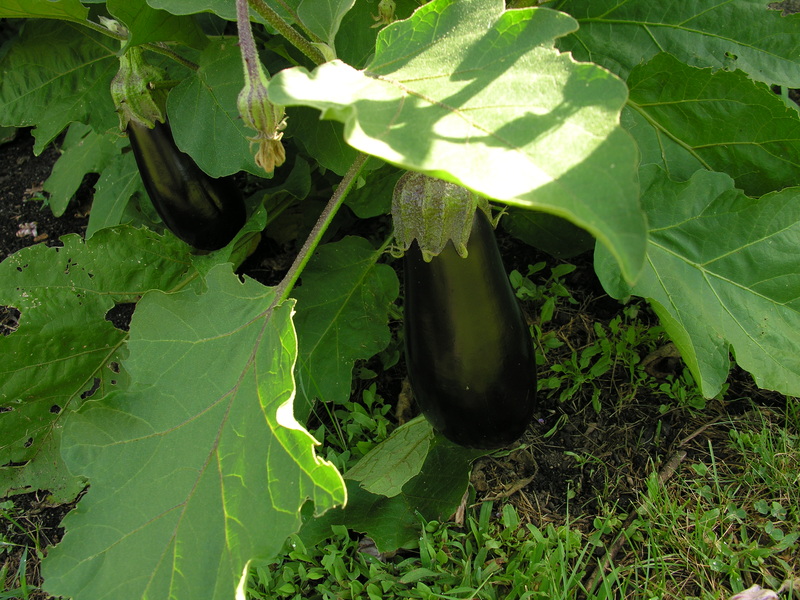 I have already begun to give eggplants away to neighbors. We can’t possibly eat them all. For a bit of perspective, here’s the eggplant bed. The mass of green is just four plants. Good thing I spaced them out! Here’s how the plants looked when I put them in the newly-created “inferno bed” at the hottest end of the house. So glad I yanked those useless shrubs. I think there are a number of factors contributing to this year’s fantastic harvest. The weather’s been perfect: hot, but breezy so there is good air circulation between the plants. I have watered them, but we’ve also been getting some good soaking rains. Then there’s the heat reflecting off the house, which is significant. Finally, the beds are entirely compost, which means I have only fed the plants a couple of times, using a seaweed-fish emulsion. Now I am scouring the Internet for eggplant recipes that aren’t ratatouille, which my husband doesn’t like. All suggestions are welcome. 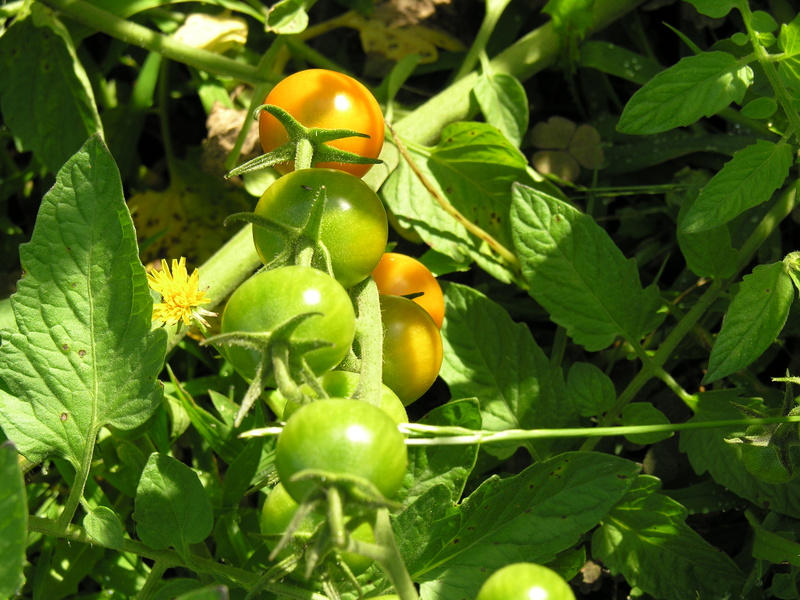 And I must give a shout out to my “Sungold” cherry tomatoes. Most of you are probably familiar with this cultivar. It is just terrific. Big and burly and so productive. And the fruits, if you pick them when they turn a bit orange, are a delicious, complex sweet-tart combination. I’ve been harvesting them for three weeks now and they just keep coming. Wow, those eggplants are impressive! I tried one plant, but it got crowded and stunted. I’d be ashamed to post a picture of the poor, sad thing. I’m a fan of my wife’s ratatouille, so I’m not much help there. She makes a big batch, then turns the leftovers into a curry (rata-curry we’ve dubbed it) or uses it to make a lasagne. Or you could just make the ratatouille and have all your friends (and readers!) over. . . Thanks, Andy. 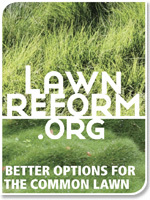 I think the main factor is lots of sunlight and heat – the more the better. I have been growing them without much success in my raised beds, which, as the season progresses and the sun gets lower, get a bit too shady. I have just found an easy Mario Batali recipe for baked eggplant. You just slice it leaving the peel on, brush with olive oil, and insert garlic slivers into the flesh. Then he says to bake it at 500 degrees for a few minutes. I think I’m going to try that one tonight. Wow, that is wonderful! Looks at all those fresh veggies. You can’t beat homegrown. Those eggplants are huge! Thanks, Martha. I am trying to pick them before they get too big, but there’s always one hiding behind the leaves. stunning, next yr is my yr to grown veggies. 25 trees lost to storm damage resulted in sun here. Just make a couple of beds out of good compost, and let nature – and your newly-found sun – do the rest. Beautiful!! There’s always eggplant parmesan. So true, CJ. I was looking at a Martha Stewart recipe that calls for baked eggplant instead of fried. I think I’ll try it. Delicious. I’m having some serious food-growing envy, as I’m a failure at that kind of gardening. Enjoy. I know people like you! My aunt for instance. She’s not into growing food at all. I like a bit of both. To each his/her own, I say. 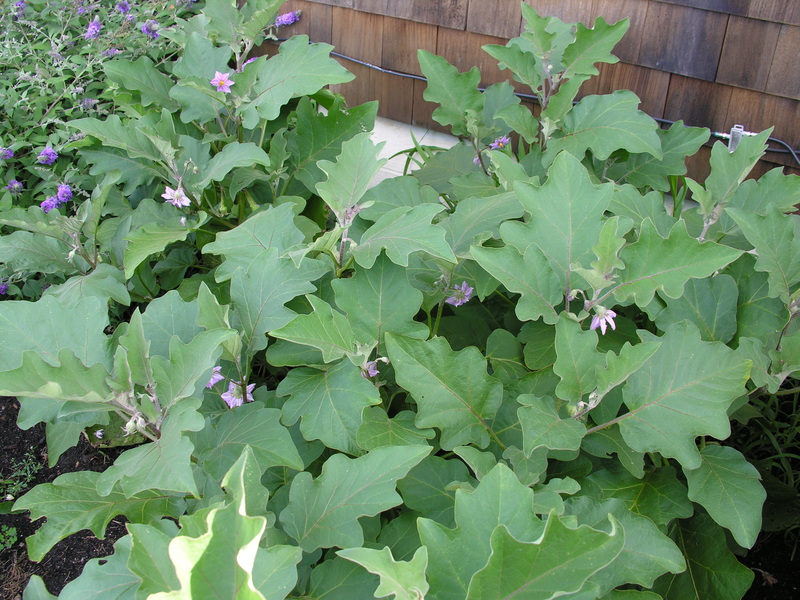 Wow, I do not even recognize those eggplant plants as eggplants. Never seen perfect leaves not riddled with holes! The luster on those eggplant. wow. I can’t take credit. I just got lucky this year. And I know what you mean about the shine. They’re even prettier in person!